A first-class glitch pedal made exclusively for creating radical glitch effects. A multi-functional glitch pedal equipped with eight modes, including multi-speed playback, pitch shift, square wave sound, and a delay that automatically samples and loops the previous phrase when triggered by a break in the input sound. When switched on, repeats the last sound received over and over. Select from playback speeds of 1x and 2x. Repeats the last sound received over and over for a different random period each time it is switched on. Select from playback speeds of 1x and 2x. In those mode, the “Time” knob can be used to set the maximum time for the randomly-determined duration. When switched on, repeats the last sound received over and over in reverse. Select from playback speeds of ½x, 1x and 2x. Automatically loops the last sampled phrase when triggered by a break in the input sound. Samples the input sound after transforming it into a square wave sound, then automatically loops the last sampled phrase when triggered by a break in the input sound. The square wave sound can be mixed between the input octave and one octave lower, allowing for the creation of a wide range of sounds. When switched on, transforms the last sound received into a square wave sound and repeats it over and over. When switched on, repeats the last received sound over and over, increasing the pitch each time it repeats. The pitch shift is chromatic, and can be set from +1 to +12. When switched on, repeats the last received sound over and over, decreasing the pitch each time it repeats. The pitch shift is chromatic, and can be set from -1 to -12. 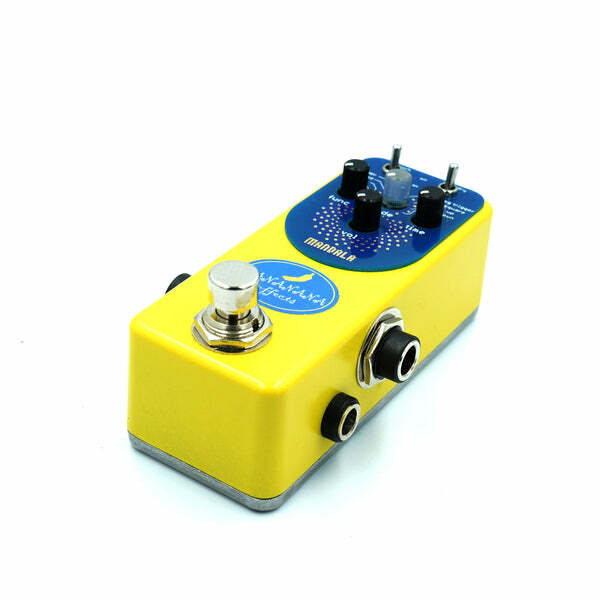 Amazing pedal! Love this company. I love it. Fast shipping to the USA as well. This thing is killer. It sounds great, and there's nothing else like it on the market. 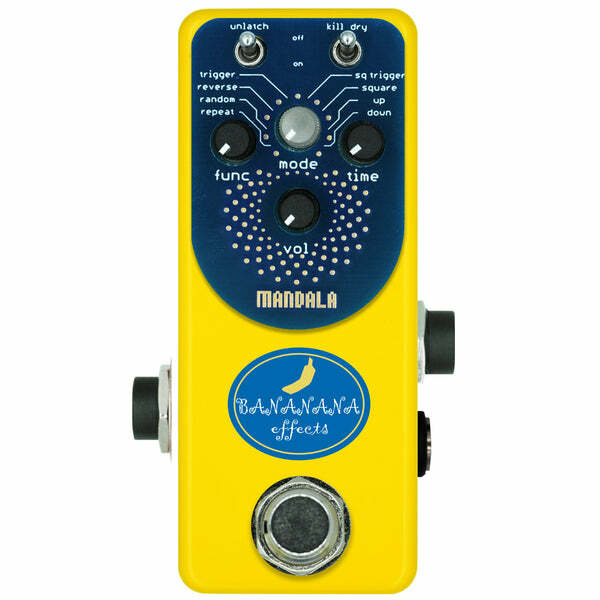 On top of that Bananana has managed to cram an enormous amount of options into such a tiny pedal. If you like to make weird noises, this is the ticket. This second take of the Mandala pedal crams in 8 glitch effects, some you’d expected and a few that are amazing. 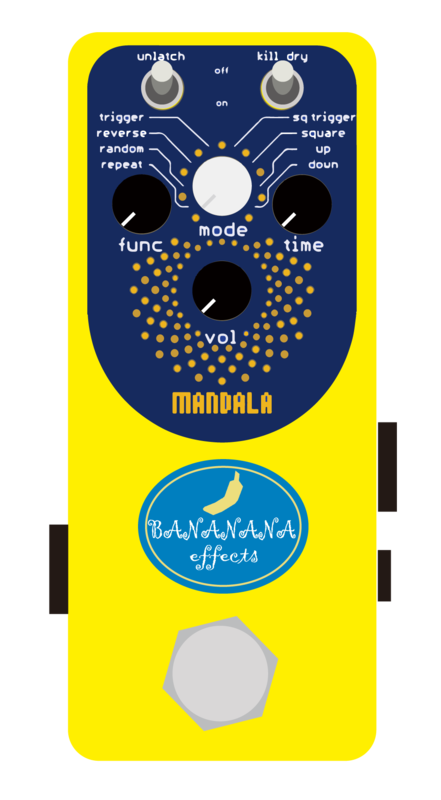 The sub and up octaves, ascending, descending, reverse and squarewave effects give Mandala a wide range of sounds and make this a very functional pedal for everyday use, especially if looking to add unique rhythmic elements to your playing. The Trigger Mode alone (starts glitching when you stop playing) is worth the price of this pedal.